Madrid is Spain's biggest city, the third most populous European city after London and Berlin, and set in the very center of the country. Madrid's architecture spans the ages, from medieval to modern. Many of its older monuments and palaces are French-influenced as well as built in traditionally Spanish styles. The grand Palacio Real is especially celebrated. 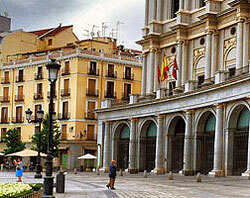 Madrid is also known for its art museums, such as the Prado. It is a city with many parks, like the popular Parque del Retiro (once the palace grounds of Felipe IV); the historic Real Jardin Botanico; and the ecological theme park and zoo Faunia. There is greenery to be found, surprisingly, even in Atocha Railway Station, Madrid's first and most central station, which has a tropical indoor garden with a regulated temperature of 24 degrees Celsius. There are many places to shop in Madrid, from upscale stores to the lively El Rastro flea market. Madrid has plenty of nightlife as well; its bars and nightclubs are filled with late-night revelers, giving it a reputation as "a city that never sleeps." Its restaurants serve international as well as Spanish cuisine, for Madrid has grown quite cosmopolitan, with minority communities of Africans, Latin Americans, Asians, and other Europeans. Madrid has undergone much development in recent years, including new housing projects and road works. The public transportation system, the buses and metro, are very modern. The city gets quite hot at mid day in summer, though the cherished afternoon siesta is no longer common among office workers and shop keepers. Spring is the most pleasant season. Snow doesn't come every year, but winter can be bitterly cold.